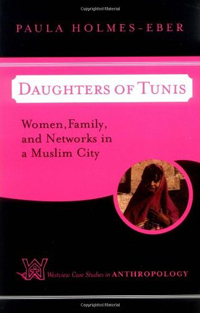 During a stint as visiting scholar at the University of Washington, Holmes-Ebner wrote the book Daughters of Tunis: Women, Family, and Networks In A Muslim City (2002). The book explores women's experiences in a Muslim country by looking at the individual stories of four Tunisian women. The four personal stories are combined with a statistical analysis of women's survival strategies in a rapidly developing Muslim nation. Since the publication of the book Holmes-Ebner has moved to Virginia where she teaches at Marine Corps University and where she has co-authored her latest book Operational Cultures for the Warfighter: Principles and Applications (2008).